The comune of Sansepolcro is located in the province of Arezzo in Tuscany. For those with little geographical knowledge of Italy, it is near Florence. Around the turn of the 20th century two sisters from Sansepolcro started a lace school. Adele and Ginna Marcelli, the daughters of a local elementary school teacher, developed a bobbin lace technique they had learned and developed it in order to personalize it to their local area and give it a decidedly Italian flavour. You can read the history of this development here, there are also some photos of Sansepolcro Lace. 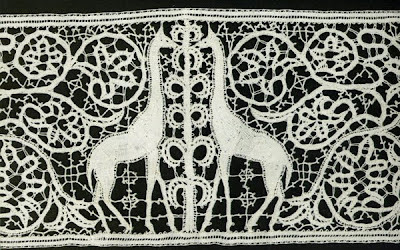 The Italian needlework scholar Elisa Ricci mentions the sisters and their lace in the introduction of her book Antiche Trine Italiane - Trine a Fuselli (1911) and there is evidence that Elisa Ricci herself believed strongly in the beauty and expertise of this lace and that she contributed quietly to its success by supplying designs and spreading the news of its development. 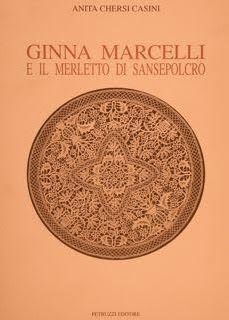 In the preface of the 2007 reprint of this volume, Bianca Rosa Bellomo has inserted a photo of an amazing work of Sansepolcro Lace from an article written by Elisa Ricci entitled: Le trine di Sansepolcro which appeared in the Italian magazine La Casa Bella in 1929. In 1983 the Sansepolcro Cultural Centre developed local exhibitions to show local artisan crafts and in 1984 started the Sansepolcro Lace Biennial which became an international event in 1990. This event is considered one of the most important lace events and hosts an international competition for lace works which is open to all kinds of lace, be it needle lace, bobbin lace, crochet lace, etc. For a full list of competition guidelines go here. It is too late to enter this time but you could get a great head start on a piece for the next show in 2012! The Sansepolcro International Lace Biennial also hosts an exhibition which is divided into five categories: European Countries, Non European Countries, Italian Regions, the International Competition and the Lace School of Sansepolcro. Each event has a theme and this year the XIV Sansepolcro International Lace Biennial, which will be held between September 11th and November 15, 2010, is dedicated to Botticelli - celebrating the 500th anniversary of his death in 1510 - the theme is: the beauty of the body and the beauty of the soul. There will also be workshops: "for theoretic-practical knowledge of the techniques of lacemaking and of their old and new workmanship, with didactic intervention by italian and foreign teachers." If you happen to be in Tuscany in the fall, you might like to take in this incredible event! 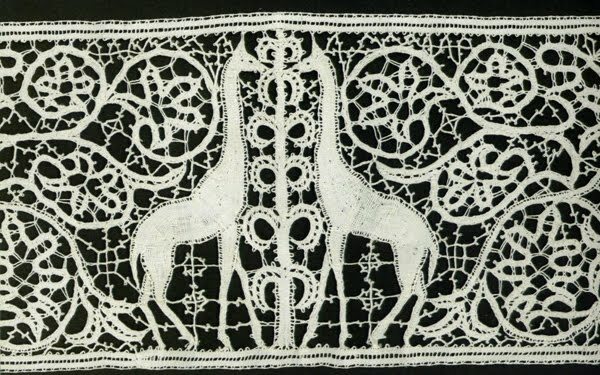 Clicking here will take you to a page in Italian on Sansepolcro Lace, click on the small photo at the beginning of the article to get a closer look at a tablecloth called: The Warriors - the lace reproduces a Roman frieze preserved in the Civic Museum of Sansepolcro. It is a work of the Marcelli sisters' school. There is also a picture of it here. Take a look at photos from a workshop taken at the XIII Biennial in 2008!